Recommended for any car running dual batteries or systems requiring a high or quick rate of charge. Outputs 50 amps at 2200 rpm and 74 amps maximum. 10 lbs. Does East Coast Auto Electric 2002 fit your vehicle? 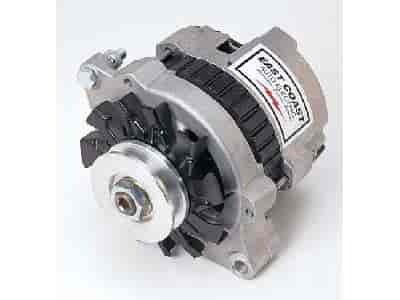 2002 - East Coast Auto Electric Super-Mini Alternator is rated 5.0 out of 5 by 1. Rated 5 out of 5 by Bowtieman from Excellent features and quality. I bought this to run on a 78 camaro. I did not have much room on the left front driver side of the engine. Using the small alternator allowed me to get it mounted. It will even run in a reverse direction and charge as well. Great product!!! East Coast shows the country of origin for the alternator as USA.